Donald Trump's position on immigration does not seem to be hurting the real-estate developer's standing in the Republican presidential primary. Two new polls have him in first place among registered Republican voters. The latest poll arrived Thursday. 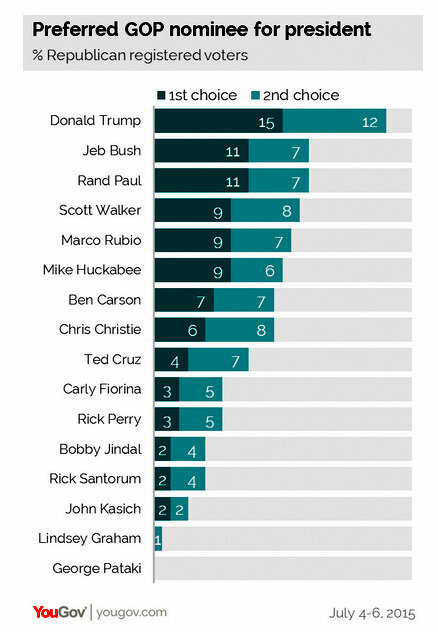 In the Economist/YouGov poll, Trump holds 15% of the Republican vote nationally — ahead of former Gov. Jeb Bush of Florida (11%). The good news for Trump doesn't stop there. A new Public Policy Polling survey of North Carolina published Wednesday also placed Trump ahead of the GOP pack. In that poll, Trump led Bush 16% to 12%. "Trump's favorability rating in North Carolina is 55/32, much higher than we were finding in national polls prior to his entry into the race," PPP director Tom Jensen said. "Trump's really caught fire with voters on the far right — 66% of 'very conservative' voters see him favorably to only 24% with a negative view of him."